Andy Haus is a second generation racecar driver from Hamburg, PA. He started his racing career driving the #76 305 sprint car for owner Dave Best in 2006. He drove the car for 3 seasons collecting 5 wins and a track championship at Hesston Speedway. During the 2008 season, the team entered a few 410 races at Clinton County using a 358 engine that the team had. After the 2008 season, they decided to try 410 racing at Port Royal to try to cut down on traveling and to be able to race at the same track as Andy's father Scott. A used 410 motor was sourced over the winter and had the car ready for opening day of the 2009 season. The jump to 410s proved to be every bit as difficult as predicted, and after half a season the team decided to part ways. Andy then jumped into one of his dad's late models, and began making the challenging transition from winged sprint cars to super late models. Andy found some limited success running a few races that season at Port Royal Speedway, recording several top 10's and even managing a 3rd place finish. The 2010 season saw Andy running the super late model full time at Port Royal Speedway. He collected his first win in July of that year, passing Waylon Wagner on the 18th lap to take the victory. The team also mixed in a few appearances at Selinsgrove, Bedford, and Williams Grove throughout the year. When the dust had settled on his first fulll season behind the wheel of a late model, Andy had secured 5th place in points at Port Royal along with the rookie of the year award. During the 2011 season, the team started off the year strong, leading the first two races at Port Royal. After cutting a tire in the season opener, Andy came back the following week and earned the victory that escaped him the week prior. Hopes were high with the early season success, unfortunately that would be the teams only trip to victory lane for the remainder of the season. After the disappointing 2011 campaign, the team reloaded in 2012 with a brand new Mastersbilt Gen-X chassis courtesy of Ed Powell Motorsports as well as the addition of Chris Kissinger as crew chief. The new combination began paying off immediately as the team morphed into a regional contender posting strong run after strong run, but was unable to put it all together to claim a regional win. 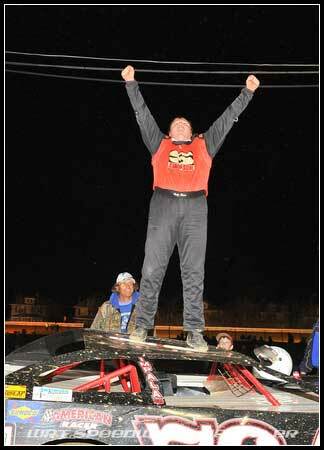 However, Andy was able to notch his first career victory at Bedford Speedway, along with another at Port Royal. Several strong runs against the World of Outlaws and Three State Flyers to end the season have the team looking forward to making a name for themselves in 2013!